We were delighted to hold a charity concert in St. Mary’s church last Thursday in aid of the Red Cross. There was a very enthusiastic audience of people on holiday and of course local Red Cross supporters, those people who give up their time for things like this to support their cause but of course give up their time in many other ways. Those local efforts often have a benefit in far flung places to aid people in need from the effect of all sorts of disasters. It would be impossible to count the number of people who owe their lives to these efforts all over the UK and in other parts. Just one of the good causes we help. The concert featured local musician James Crowney Richards on Saxophone accompanied by Mark Thompson. James is only 17 years old and currently attending Greenhill School but he has been playing Tenor Sax since he was 12 years old. He recently passed Grade 8 with merit. 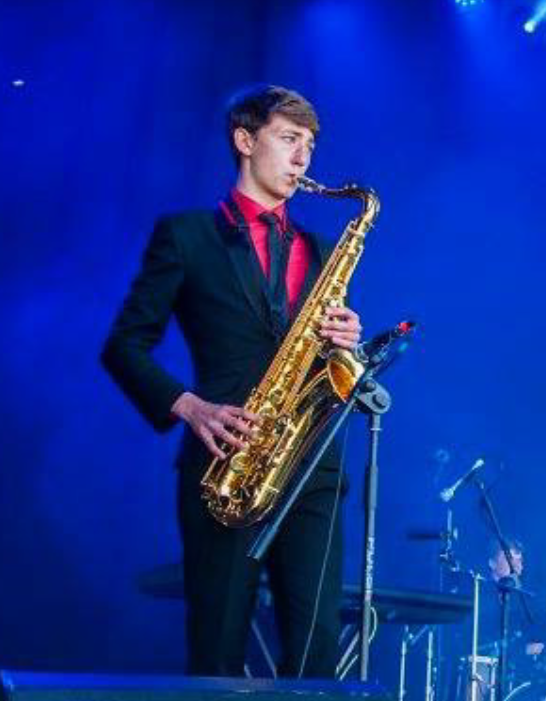 He is a very busy musician performing with Greenhill School Wind Band, Jazz Band and Orchestra, the Pembrokeshire County Schools Symphonic Wind Band and Big Band and is a member of local 7 piece function band, Tuxedo Funktion established in 2013. There is little rest for the choir as two days after that concert we performed in Fishguard at a dinner of the Fishguard Lions where we received a standing ovation from the large audience. Paul Varallo performed four solo songs on the night being Stars, Anfonaf Angel, At Lan y Mor and La Danza by Gioacchino Rossini lyrics by Carlo Pepoli. Paul sang this final number in Italian. Our busy programme continued on Monday evening with a rehearsal for our 2018 Massed Choirs concert which will take place in 2018 at the Royal Albert Hall and this weekend we will be at an international competitive festival in Cornwall featuring 21 British choirs, six of them from Wales, 8 Overseas choirs from Russia, Germany, Norway, USA, Australia, Czech Republic, Sweden and Finland and no less than 28 Cornish choirs.. This competition has meant us not only practising our singing but also what we refer to as “staging” this being our positioning and the process of assembling and leaving the area where we are to perform. Whilst we don’t take this lightly it has to be said that it has not always been undertaken with military precision or at least if it was I am not sure which army it was based on. Perhaps a clue may be found in the tune which our accompanist Jill Williams often plays which is a World War 2 song featured in Dad’s Army. This at least gives the audience something to smile about. Our full choir programme for 2017 can be downloaded in printable version from the choir website. Christmas is over. Our short break is behind us and we began rehearsals again last week so its time to look ahead to a new choir season. During last year we had a number of new members join us and all of them have settled in and added to the size and quality of the choir. Sometimes new members come along because they move into the area or just find that they have more time for one reason or another but they are always welcome. However, this year we have decided to make a specific effort to recruit new members with a couple of invitation evenings. If you’ve never sung in a choir we know it can be daunting to take that first step so we want to try to make that easier. We have set aside two rehearsal evenings on 17th and 31st January. The idea of this is to let potential new members come along and sit in on a rehearsal session to see how it goes. Our MD and the committee are putting in lots of effort to make these evenings a bit of fun and will not involve new recruits in voice tests or even singing at all if they don’t wish to. Just as you might do in a pub or club you can just join in and sing along if you wish or just sit, watch and listen. In the choir we have some very good voices, we have some very average voices and it is even possible we have some who are not all that good but in a choir it is about getting the best out of everyone and about improving on whatever abilities we have. Like anything in the world you get better with practice. We do use music sheets but many of the choir cannot read music as its not necessary but it does help to see the music scores as you hear the other voices around you. We also sing in Welsh sometimes but the vast majority of members don’t speak Welsh. So we use the few Welsh speakers we do have to help non-Welsh speakers pronounce the words and we also have a variety of CDs to aid learning of both the Welsh and the music. We even have music for each section of the choir stored on our website for playing on your Iphone’s tablets etc. So the message is that singing is fun, a lot of people like singing and this is a chance to see what being in a choir is really like and don’t let things like Welsh or reading music put you off. Apart from singing being in a choir involves you in a number of other enjoyable and fulfilling activities. There is always the chance of a few drinks and a bit of hwyl in the County Club after our rehearsals or concerts in Tenby but we also travel to different places. Next year we will have trips to Ledbury, Herefordshire and Newquay, Cornwall. We also get out and about in our own area with concerts, some indoor and some outdoor in Fishguard, Narberth, Saundersfoot, Lawrenny and Cresswell Quay. This year’s programme involves four hotel concerts at the Giltar Hotel Tenby. These are a different kind of evening being a bit less formal and often involve anything from stand up comedy, to soloists and guitar performances. Looking farther ahead we have been invited to sing at the Royal Albert Hall, in London in 2018 so you could find yourself taking part with a number of other choirs in a concert at this prestigious event. 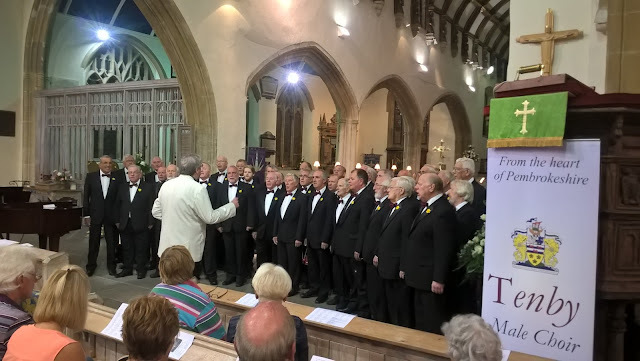 The final aspect of Tenby male choir is that we put on concerts to raise money for for local charities and this year we will hold concerts for the Red Cross, the Stroke Association, St Johns Ambulance, RNLI, HOPE, Bloodwise, the Arts Festival and Air Ambulance Wales. Why not come and meet us and see if being in a choir is for you. Even if you should find that you don’t want to join in the singing at first or perhaps never there are plenty of social events organised by the Friends of Tenby Male choir and we would really welcome more people to join in this group to support the choir in a non-singing capacity.